The month of May at the Lair has been dedicated to some wicked indie talent. From music to movie makers, and now to my second creepy author of the month, Matt Hayward, who's work has been nominated for a Bram Stoker Award and garnered a nomination from Penguin Books for short story of the year, 2017. Lili's Lair: Why do you write? Matt Hayward: Because I’d make a piss-poor salesman. I started writing as an exercise back when I was a lyricist to broaden my vocabulary and experiment with ‘crop rotation’ so that when I returned to writing songs, I’d approach at a fresh angle. But then I guess I caught the prose writing bug and I’ve been sick ever since. Lili's Lair: How did you get your start writing? Matt Hayward: I sold my first collection last February, and soon after, my debut novel. I originally had a bet with a friend to see who could sell a story first. Neither of us had written anything serious, but we both loved horror fiction. He never submitted his story. I did and got rejected, but I kept writing. Within a year I signed the contract for BRAIN DEAD BLUES. Lili's Lair: What do you feel is the hardest part of writing a story or novel? Matt Hayward: The first draft can be a strain. I usually have bullet-points for where I want a story to go, but the characters often waddle off like wind-up toys and I just nervously follow. Sometimes they get snagged in dead-ends and that leads to backtracking and hair-pulling, but other times they hit gold. You never know, so for that reason, I’d call the first draft the hardest. Lili's Lair: Where do the ideas for your stories come from? Matt Hayward: It’s a sum of two parts. I usually get (what I call) the story’s ’heart’ or the ’skeleton’ from issues I’d like to address. An example would be the commentary on addiction and overcoming adversity in WHAT DO MONSTERS FEAR? The second part is the ‘meat’ of the tale, and for me, that’s entertainment - usually drawn from the situation. For example, the farmhouse and the monster. All writers get that eureka moment when the two slot together. Lili's Lair: What other authors, if any have inspired you and why? Matt Hayward: JF Gonzalez and Brian Keene for inspiring me to give this a try. I equate finding their work to discovering NIRVANA as a teenager and picking up a guitar. Reading them was like getting permission to give this a shot. Joe Lansdale for his inadvertent lessons on voice - just reading his work is a crash course on writing. Bentley Little for his melding of the aforementioned ‘issues and entertainment’. Lili's Lair: How would you like to be remembered as a professional writer? Matt Hayward: As long as people enjoy the work, that’s all I can ask for. How people remember me is up to them. Lili's Lair: Can you tell us about any future projects you are working on? 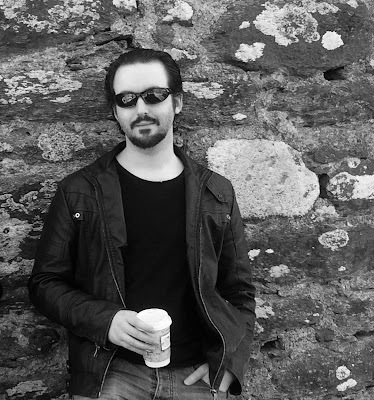 Matt Hayward: I’m currently writing a novel called THE BILE LORDS with Bryan Smith, and I’m halfway through a straightforward Irish crime novel titled THE DEVIL CAME HOME. A collaboration I did with Patrick Lacey called PRACTITIONERS releases this July, and the hardback edition of WHAT DO MONSTERS FEAR? launches on Thunderstorm Books next month (featuring a new foreword by Edward Lee). I also have a new novel titled THE FAITHFUL coming in October on Sinister Grin Press and I’m wrapping a new collection called HUSH. There’s no shortage of upcoming stories… And as long as people keep enjoying them, I’ll keep writing them. Matt Hayward is a Bram Stoker Award-nominated author and musician from Ireland. His debut collection BRAIN DEAD BLUES released in May 2017, and his first novel WHAT DO MONSTERS FEAR? in July. PRACTITIONERS, a collaboration with author Patrick Lacey, is set for release in 2018 through Blood Shot Books, as well as his second novel THE FAITHFUL. He is currently writing a novel with Bryan Smith and has just released a comic book with the band WALKING PAPERS. Matt received a nomination for short story of the year from Penguin Books in 2017, and his work has appeared in CLICKERS FOREVER: A TRIBUTE TO J.F. GONZALEZ, TALES FROM THE LAKE, DARK MOON DIGEST, THE HORROR ZINE, TALES TO TERRIFY, and more. Give Matt a follow on Twitter to stay up to date on all his happenings, and check out his website, SundanceCrow, where not only can you find out about his writing, but you can also listen to his music.